I’m sure you’ve seen the media reports on sugar lately. Too much of it can be bad for you. But the media can sometimes oversimplify. In fact, there are a lot of misconceptions. 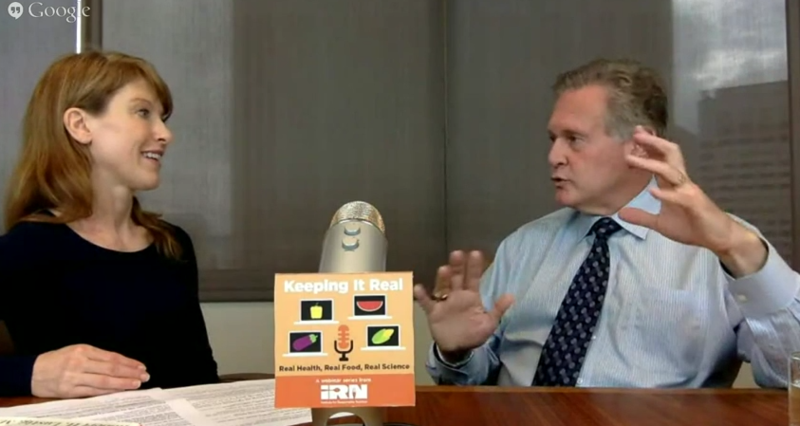 This week I got together with Dr. Robert Lustig on a webinar for the Institute for Responsible Nutrition. Dr. Lustig is a major contributor to the public body of knowledge on the health risks of eating too much sugar without knowing it (specifically fructose, the bulk of which is found in processed food)*. We talked about what his research is really showing about sugar. Some of what he said during our discussion may have surprised you. His theory as to why obesity is sweeping the country and the globe. Whether or not he thinks it’s better to eat non-calorie sweeteners than real sugar (spoiler alert: he does not). If he thinks people should avoid fruit, since its main sugar is fructose (spoiler alert: he doesn’t). What he says about the popular theory that agave and honey are better sweeteners than others. Why people shouldn’t care about the Glycemic Index when choosing food. the complexities of how sugar affects people, since there is much misinterpretation of the facts in the media. I think we accomplished that goal for the most part! 1. If “a calorie is not a calorie” like Dr. Lustig says, then how am I supposed to know what to eat? The main fact behind Dr. Lustig’s statement is that calories from fiber aren’t absorbed. So, the calories in food with natural fiber (foods like fruits, vegetables and whole grains) will always register as higher than the number you’ll actually be taking in. On the other hand, when you eat processed foods, fast foods or sweets without the natural fiber you’ll absorb all the calories. To top it off, sweets and processed foods act differently in your body. One major difference is that the sugar gets into your blood stream faster because there’s no fiber to slow down the absorption process. (You can see more about this in the video). So, eat more whole fruits and vegetables, whole grains and lean proteins, and eat less processed foods, fast foods and sugar-laden foods. 2. Since calories aren’t that straightforward, is food logging useless? Calories still count. If you overeat your calories you’ll still gain weight. Logging your food is still a good way to keep tabs on how much you’re eating. Keep in mind though, that calorie counting was never a perfect science. I mean, do you always eat a perfectly measured medium apple? Do you always burn exactly 1200 calories on the days you don’t exercise? (The answer to both of those is no.) But, it can give you a good general idea of what you’re doing with food and exercise and help you to modify your habits in a general way. It’ll also help you to see if you’re moving in the right direction when you make changes. Right now, it’s the best approximation we’ve got, so use it until we get a better one. 3. If it’s not my fault that I’m overweight, like Dr. Lustig says, should I stop trying to lose weight? Dr. Lustig was explaining the catch-22 that happens when we overeat processed foods and foods laced with invisible sugar that are in processed and fast foods. There are significant changes that take place in the body and brain that are hard to reverse. But that doesn’t mean that you can’t take action and make things better. The one best thing you can do for yourself is start to eat more whole foods: whole fruits and vegetables, whole grains, and lean, responsibly raised proteins. And try to make more food at home so you know what you’re eating. Remember, it doesn’t help to just start taking foods out of your diet. It leaves a gaping hole, and a burning desire for the food that’s missing. Clients of mine find when they start to put more healthy foods into their diets it helps to push out the unhealthy ones. You can do this too. Taking small steps towards healthier eating and more exercise is always going to be the most successful way to make changes. It makes a big goal more manageable. Always pat yourself on the back when you succeed in each new step. Share your accomplishments with people, and bask a little in your success. Because health, like life, is a journey that should be enjoyed. Do you have any conversation to add? Share with me in the comments. * Dr. Lustig is a pediatric neuroendocrinologist at university of California San Francisco, author of the best selling book Fat Chance: Beating the odds against Sugar, Processed Foods, Obesity and Disease, and founder of the institute for Responsible Nutrition.